My integrating sphere can't accept the Makai head so I didn't take any comparative measures in terms of flux. I expect that once I get the 3S buck converters I will be building at least a couple Haikus with them and on the 2x123 paks. I will then be able to get a decent idea of flux as it relates to drive current. I would anticipate a reasonably proportional relationship between relative flux and relative lux. Last edited by Moka; 06-29-2010 at 12:22 AM. A man can also go blind! Beautiful light, looks like the XP-G has great spill to compliment the throw. That is one beautiful looking light! What are the chances of a battery tube to accept 18650? I will be anxiously awaiting further news on the development of this light to wave status! What the beam shots presented don't illustrate is the strength of the spill portion of the beam from the Makai and this is something that I am not willing to sacrifice. In the beam shots, there is a toad on the lawn and he didn't move much during the time I needed to get the three shots. I suspect there are good dedicated "throwers" out there that will easily surpass the range of the Makai but they may not illuminate Mr. toad in the foreground and that could be a problem for Mr. Toad if you were headed his way. One of the things that bothered me back when we were putting 40 - 80 lumen LED's behind reflectors such as the one in the Makai was the weakness of the spill of the beam. Now that we have LED's capable of flux levels like the XP-G the spill can reach out there much better and can be quite useful in its own right. I believe there is real utility in such a beam pattern but it is certainly not the only option nor is it the best choice for many applications. I think the XP-G has enough flux (even under driven) to merit its coupling with a reflector like this one. I state this as opinion not fact, and others are entitled to their opinions and I won't contest them. I would imagine that the setup I tested last night is not too dissimilar (SOB1000 with XPG/R5 in an Aleph-3 head). I was able to compare this side by side with a DB917 with SSC-P4 LE in another Aleph-3 head. They both threw about the same but the XPG-R5 setup provided noticeably more spill and a more useful beam as a consequence. The overall output flux is also higher but not overwhelmingly so. Awesome! Pure awesome! The beam that is emitted is very impressive, and I am in love with your new 38mm head. The XP-G at 1.45A with the McR-38-XP-G reflector is just plain awesome. Oh wait, I already said that I'm at a lost for words. I can't wait for the 3s buck converters. I have been searching and waiting for someone to develop them. These look really really great! Last edited by maxspeeds; 06-29-2010 at 05:00 AM. +1 to Head & LE only - would go great on my 2x123 (1x17670) McClicky pak. Looks great - glad to hear the XP-G has good spill as well, makes it more useful IMO. That is a very, very nice addition to the titanium lineup. Those do not come cheap but I believe that on a bulletproof waterproof titanium light it does really bring some serious piece of mind. A mineral glass would have been a real weak point in the picture. Been a while since a light made me post over on CPF. The Mcgizmo thrower looks excellent. I m liking plain old non aspheric thrower for thier huge amount of very useable spill. A thrower from McGizmo... Well, let's say throwy light, that's closer to reality I guess. Has it an SMO reflector? I think I detect a slight OP in most pictures, but I'm not sure, it would be logical though... After all, nice beams go hand-in-hand with OP reflectors and SMO are for dedicated thowers with no side spill at all. Comparing the beam of the Haiku to the Makai 2x123 I get a grin in my face. They are pretty much the same with the difference that the close you come to the hotspot, the more brightness you have. What's more, teh beam is wider. That's a Haiku on steroids, would be my choice for sure! Count me in for a 2 x 123 please! The reflector has an orange peel surface like all of my reflectors. No doubt a specular finish would increase the lux at any drive level but likely with some artifact and perhaps some relative null rings in the beam pattern. I didn't give any real thought to lens combos on this but I did give some serious thought to a shorter focal length and deeper reflector like the McR-27 L series. But considering the larger apparent image size of the XP-G coupled with its amazing flux, I felt the longer focal length of the McR-38 would enhance collimation and that the magnitude of flux in the light escaping in spill would be sufficient for a good flood around the spot and larger in viewing angle than a deeper and shorter focal length reflector. Even though this light was designed to target and illuminate objects at significantly further distances than my other lights, at heart I still want flood and want to know as much as possible, what lies between me and that distant target. If there are any potential threats of objects of interest between you and the visible horizon, it's certainly nice to see them! On the 1x123 pak, the light is definitely short in your hand but probably manageable for most of us. On the 2x123 or 2xAA, the head diameter is not part of the grip unless you choose to make it so for balance or whatever. The head also has some mass to it that you can feel and potentially even use as a deterrent to some critter intent on violating your space. Sometimes something larger in the front makes it easier to clear the way. 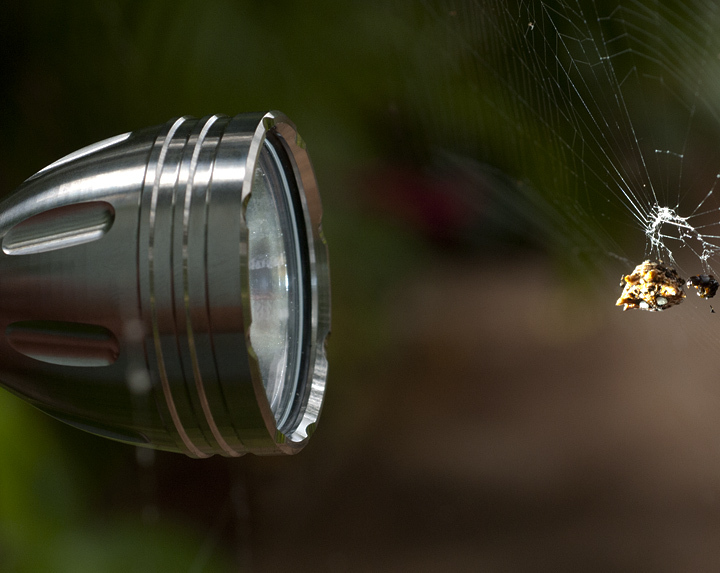 In the image below, I had to clear past some abandoned web to get up close to the crab spider. The Makai made more room for my hand to follow than a smaller diameter light would have. With a 2x pak on the Makai, I think I will feel more comfortable on a night snorkel as the light will provide me with a better tool for potentially fending off than a similar light with smaller and less massive head. Gotta have one! Absolutely beautiful... count me in for a 2x123 - I need a throwy light and I love the fact that you preserved some spill. THis is the most beautiful head you ever did, Bud. I would agree with that. The design is very refined, very balanced. This is the kind of look that may not make people "WOW" at first sight but certainly grow on you quickly. At least that's how McGizmo's work on me. I think I've changed my mind..,I need a 2X123 body as well!!!! That is indeed very beautiful. I've always been a fan of the flutes over the ribs. Looking forward to the wave. I''m glad you finally let this cat out of the bag, Don. It's been 5½ years since you sold me my first McGizmo, a custom green swirl Aleph 3 2x123...what's that, about 3 generations of LEDs? I still love the output of the Aleph 3/McR-38/LuxIII, but the idea of being able to really reach out with a newer LED, plus having good flood, is like finally finding that missing puzzle piece. Thank you for waiting until the time was right and for bringing the wait almost to an end. Your ability to find good design compromises while not producing something before its time is one of the biggest reasons I enjoy your lights. I really can't think of a better light to be #15 in my McGizmo collection. I keep going back to look at the pictures in the original post... I can't wait to get one in hand! My only McGizmo frame of reference for throw is my PD-S27, but this looks like more of a good thing. See what happens when I go 48 hours with no CPF, Don throws up a new light!! That is a good looking chunk of Ti and Sapphire! Please, please make enough of these in the 2 x 123 configuration that I don't have to wait next to my computer to snag one!!! I am all for the 1250 ma plan on high as well! This light is plain magnificent; I always loved the HD45 but wanted it with an upgraded emitter and the 3 speed is awesome! I am very looking for this grail.